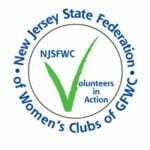 We are part of the New Jersey State Federation of Woman’s Clubs, the largest volunteer women’s service organization in the state and a member of the General Federation of Women’s Clubs (GFWC). The goal of the New Jersey State Federation of Women's Clubs is to enhance the quality of life within our respective communities and state by transforming public interest and concerns into meaningful projects anmd programs; to afford our members opportunities for the development of individual sklills, talents and abilities; and to serve as a grass roots volunteer resource in New Jersey communities. She will be delighted to send you an application and answer any questions you have about our active club.